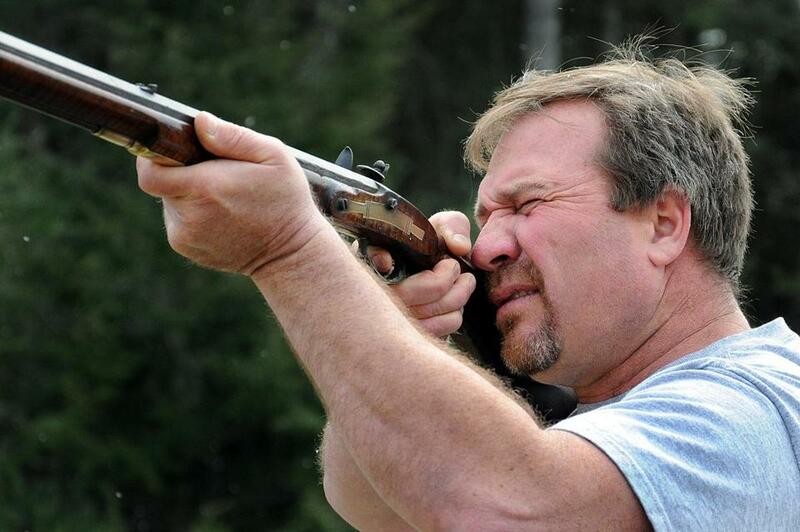 Bill Barchant takes aim with a Kentucky Flintlock long rifle outside his Lakeville home. “I find a safe place for unwanted guns to go,” he says. When Bill Bachant appears on a client’s doorstep to pick up unwanted weapons, he never knows what he’ll leave with. That’s the whole point of his Gun Orphanage. Bachant promises to take in firearms of any kind, in any quantity. So every house call is an adventure. Sometimes, he leaves with broken firearms and parts. Other times, he leaves with treasures. “I find a safe place for unwanted guns to go,” said the 48-year-old Lakeville resident, sounding more like a sentimental parent than a firearms wholesaler. While news of recent mass shootings has many people calling for tighter gun control, Bachant is an ardent Second Amendment supporter who says he’s doing his part to make sure second-hand firearms aren’t misused. When he’s not on the road, Bachant runs his “orphanage” out of his Lakeville home, where he cleans and repairs the firearms he has collected during his travels. Since launching the business last year, he’s received some interesting calls and acquired several unique weapons. “A lot of homes have guns,” said Bachant. Sometimes, “people don’t know what’s stuffed in the corner” of their closet or attic. Having a gun at home is not uncommon today. There are more than 300 million privately owned guns in the United States, and that number increases by about 10 million every year, according to the National Rifle Association of America. A Gallup poll last December showed that 43 percent of Americans reported having a gun on their property. But if you want to get rid of a gun, you can’t just toss it in the garbage or sell a .22 on Craigslist. That’s where Bachant comes in. He said he has been called by widows who inherited guns from their husbands, and elderly gun owners who are growing frail and no longer shoot. He recently helped a woman who moved to Massachusetts from Kentucky and wanted to unload her gun collection because she didn’t want to go through the hassle of getting state permits. Unlike some dealers, who might be choosy about what they buy, Bachant goes to people’s homes and promises to take away any firearm. Even stuff he doesn’t want. “I take everything . . . parts . . . BB guns . . . everything,” he said. Bachant will write the person a check or make a donation to a charity of their choosing. He’ll then sell the firearms to a licensed gun dealer. When Bachant gets stuck with items that are beyond repair, he sells them for parts. Once in a while, he’ll keep one for his personal collection. A builder by trade, Bachant also owns a real estate company. He has worked with firearms for decades. He holds a federal firearms license and is a registered manufacturer and wholesaler of guns. He also offers gun safety courses at his home, and said current events can affect that business. While he noticed no change after the Washington Naval Yard shootings last month, in the aftermath of the school shootings in Newtown, Conn., when Congress was debating new gun-control laws, inquiries increased. 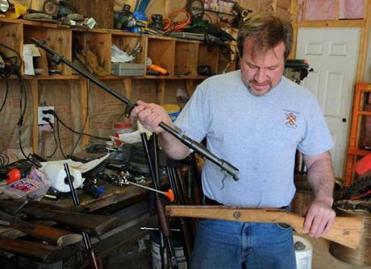 Bill Bachant works on a Japanese rifle at his shop in Lakeville. Items beyond repair, he says, he sells for parts. “After Newtown, I think a lot of people felt vulnerable” and there was an uptick in calls, especially from women, asking about gun safety courses, he said. Bachant has clients across the country. They can ship their unloaded firearms to him through a private carrier like UPS or FedEx (not the US Postal Service), and Bachant will send them a payment. For gun owners in Massachusetts, he makes an appointment to pick them up personally. He once showed up at a ship captain’s mansion in Mattapoisett and left with two grimy flintlock Kentucky long rifles dating back to the late 1700s. Eight hours of cleaning and polishing eventually revealed shiny brass and tiger stripe maple. On one of the rifles, he discovered the words “J. John No. 149” engraved on the steel barrel. Bachant hopes to figure out who owned it. Another time, Bachant left a Needham home with an antique pinfire derringer pistol. “They haven’t made ammo for this in 150 years,” he said. Pinfire cartridges had an individual firing pin built into each cartridge. “It’s unique. I’ve never seen anything like it before,” said Bachant. Further research showed that it was made in Belgium. On a trip to Middleborough, Bachant turned up a small pistol manufactured in 1897 by Harrington & Richardson, a gun company founded in Worcester. He also found a Coca-Cola commemorative shotgun. He chuckled at the thought of the soft drink giant teaming up with Winchester to make limited-edition shotguns and rifles emblazoned with the Coca-Cola logo. Once he got a call from a Plymouth gun owner who claimed to have 17th-century dueling pistols adorned with jewels. Bachant inspected them and delivered the bad news. “I had to tell him they were fake . . . they weren’t even real guns,” he said. 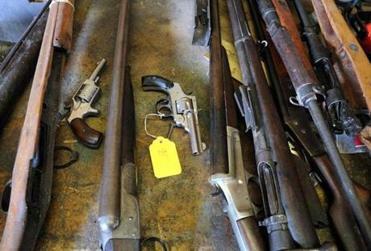 The Gun Orphanage provides the kind of service that police recommend to owners of unwanted guns, according to Natick Police Chief James G. Hicks, who also is president of the Massachusetts Chiefs of Police Association. If someone inherits a gun from a deceased relative, and they don’t want to keep it, “we recommend they go to a licensed dealer,” said Hicks. Police prefer that option, he said, because dealers who hold federal firearms licenses (like Bachant) must keep detailed records of their firearms sales and fulfill other legal requirements. Such record-keeping is important to law enforcement. Hicks said people occasionally bring unwanted firearms to police stations, unsure of what to do with them. “Our policy is such that we keep [the firearm] here for storage until they decide how they want to dispose of it. It sits in the [Natick Police Department] evidence room,” he said. Some other police departments — especially those with small evidence rooms — have a bonded warehouse where they store unwanted guns, according to Hicks. Hicks noted that people who don’t have a firearms license aren’t supposed to transport guns. Instead of dropping guns off at the station, people should ask police to pick them up. That’s what prompted Bachant to launch the Gun Orphanage. “I just heard the need for it,” he said.